Induction heating (IH) is a new cooking method that uses electromagnetic force to heat the rice pot. The IH method heats food more rapidly and with less loss of energy than the conventional sheathed heaters used on gas and electric rice cookers. * At the present Health Department Regulations do not require overhead ventilation hoods for Induction Heating Rice Cookers. 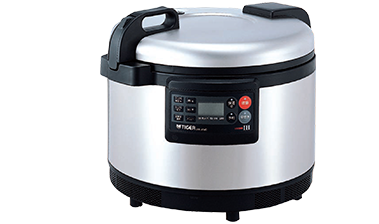 The TIGER JIW-540 IH Rice Cooker uses the most advanced induction technology available to cook the most delicious rice. Unlike conventional cookers that cook only from the bottom of the pot, the JIW-540 uses induction technology to cook from all sides (except the top) at high temperatures (+280F), resulting in luscious, plump, and full flavored rice cooked in fraction of the regular time. The JIW-540 comes equipped with an automated, pre-programmed microcomputer which enables the simple preparation of various types of rice. Also, you can create own secret recipe by adjusting the pre-programmed settings for extraordinary rice! Now anyone can make superb rice! With the touch of a button, prepare various types of rice, including: White, Brown, Sushi, Takikomi, and Porridge. An easy-to-use timer allows you to pick the time when you want the rice to finish cooking. No need anymore for early morning shifts just to prepare rice.